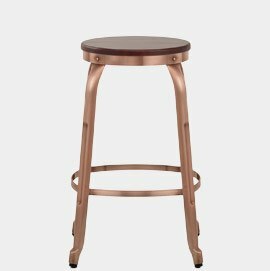 Ever found the perfect piece for your interior, but it was only available in gold whilst your décor was silver? Well, with this latest trend you don’t have to look for something else! 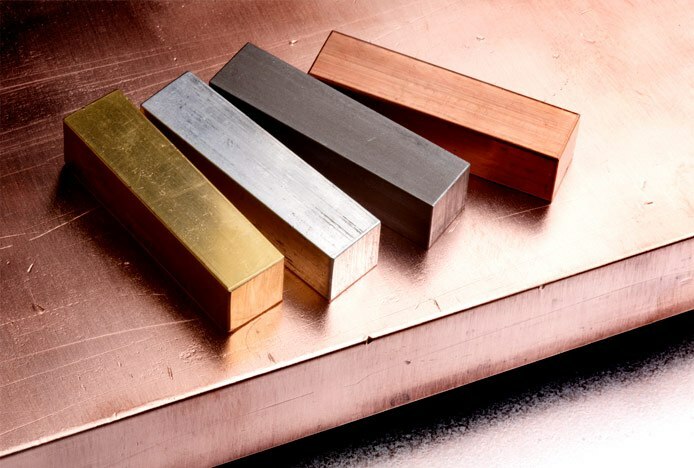 Break the mould and mix your metals – pair gold with silver, copper with chrome, or brass with steel. Using one type of metal throughout your interior creates a clean and uniform setting, and we naturally strive for this because for years it has been seen as ‘the right way’. However, using two or three different metals can add interest and personality to the room. In this article we will show you some examples and discuss how to get the look. To start, choose a dominant metal to be used in key features throughout the room, then choose an accent metal for smaller details. In a large space, you could use up to three different varieties, but in smaller rooms more than two types may compete for attention and end up looking cluttered and overwhelming. Separating the different metals by height or by feature will create context within the space. For example, in the kitchen you could have copper pendant lighting, with brushed steel appliances and taps at worktop height, whilst anything below worktop height, like cabinet handles and bar stools, might have a satin black finish. It’s wise to stick to classic finishes like stainless steel for larger fixed appliances, and save more extravagant gold and brass for decorative items. This makes it easier to sell your home in the future, and it’s also much easier to find ovens and fridges with a steel finish. But, if you’re feeling brave go for a completely unique piece like the two-tone brass and steel oven below. Two-tone items are an easy way to try out this look, but as you can see this kitchen also features chrome taps and cookware with antique copper cabinet handles and accessories. Try to use metals that complement your colour scheme. For example, if your kitchen has a grey colour scheme with slate floors or concrete worktops, then a cool gunmetal finish will complement it well. However, this could end up looking quite cold, so you could try introducing warmer metals like brass or gold to balance the temperature. This is also a clever way to add some colour to an otherwise neutral room. If you would prefer to stick to all warm tones or all cool tones, opt for pieces with different textures to add depth. Pairing chrome-plated steel appliances with brushed steel bar stools is a good example, as they both have a similar silvery tone but the chrome has a shining polished finished whilst the brushed steel is more muted and matt. In the first kitchen shown below (Fig. 1) there are three metals in use: gold, copper, and stainless steel, and they are divided by each section of the room. Along the back wall you can see there is a stainless steel work surface, with a matching sink and extractor hood. Then, the central island has a marble worktop in an orange brown hue, which complements the copper sink and tap. Finally, gold has been used up above in the pendant lighting, creating a clear separation of each metal. 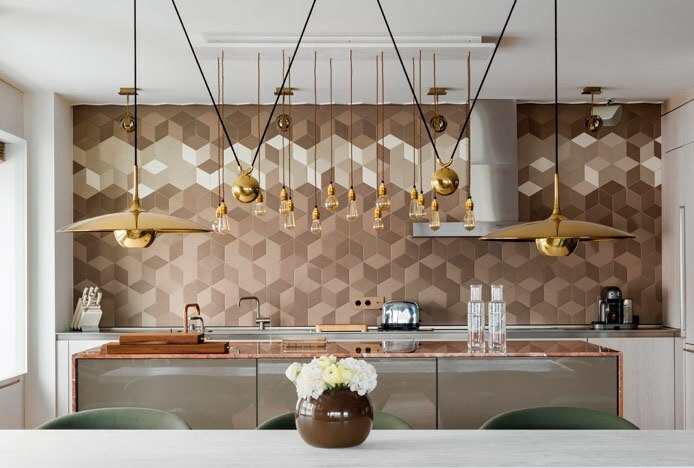 This arrangement works as the varying warm and cool tones in the tiling help to tie everything together, and the neutral ceiling and walls stop the kitchen becoming overcrowded. This next kitchen (Fig. 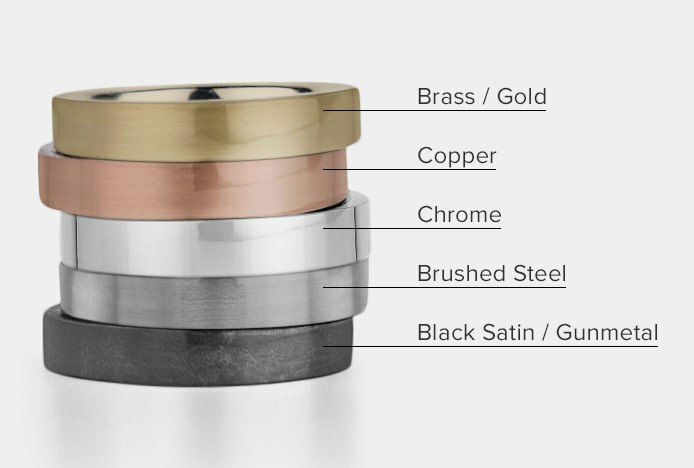 2) is a more modest example but still includes three different metals: stainless steel, chrome, and black satin. The more classic finishes have been used in the fixed elements, as you can see in the chrome taps and the stainless steel oven and cabinet handles. 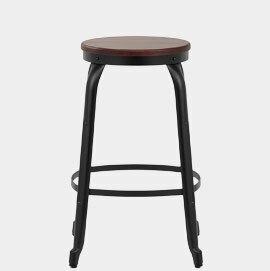 Meanwhile, the decorative lighting and bar stools have an unconventional black satin finish. Choosing a bold finish for smaller inexpensive items allows you to experiment and easily switch up your décor when you fancy a change. The black satin in the kitchen below has an industrial quality that complements the rustic wood features. And, although all three of the different metals used here have cooler tones, the warmth of the wood works to balance the temperature. Our final example below (Fig. 3) is not for the fainthearted. 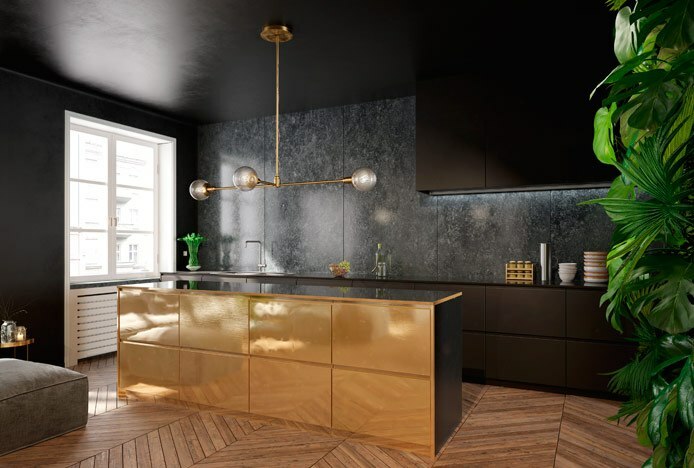 The dominant metal here is gold, making a stunning impression on the front of the kitchen island as well as the light fixture and side table. The sink has a stainless steel finish and is matched by the kitchen accessories. 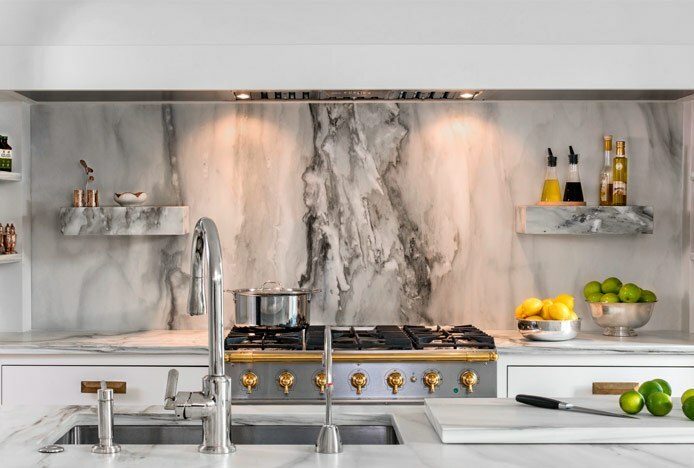 These steel features almost disappear into the dark grey backdrop, whilst the gold takes centre stage and adds a warm contrast to the dark walls and cabinets. As demonstrated here, choosing a spectacular metallic statement piece is an exciting way to introduce more than one metal. This may be a large antique brass pendant light, or a copper cooker hood, or even a gold kitchen island. 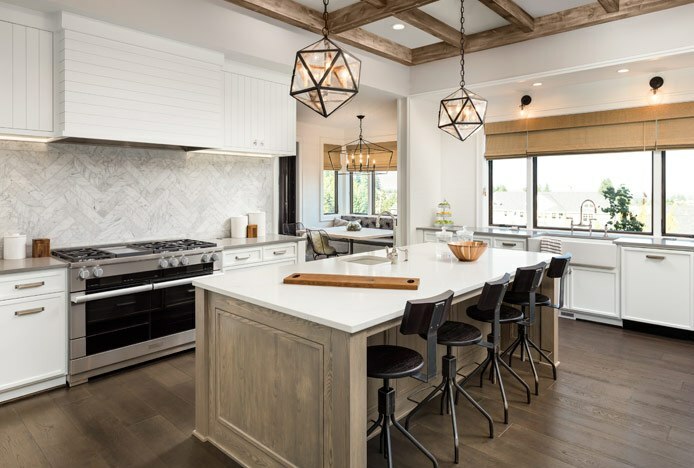 If you glance at our example kitchens above, the mixed metals may not even be the first thing you notice, and that’s because they do not look out of place! Different metals come in and out of fashion as the years go by, so why limit yourself to just one if it will look dated next year? Mixing metals will keep things looking fresh and interesting for longer, so take some inspiration from our tips and examples and don’t be afraid to do things differently. Go back in time and take a look at how the kitchen has changed over the years..
Get inspired and take a look at how our stools are used in seven stylish kitchens..